Gentian first appeared in Harper's Bazaar (January, 1886). It had been raining hard all night; when the morning dawned clear everything looked vivid and unnatural. The wet leaves on the trees and hedges seemed to emit a real green light of their own; the tree trunks were black and dank, and the spots of moss on them stood out distinctly. A tall old woman was coming quickly up the street. She had on a stiffly starched calico gown, which sprang and rattled as she walked. She kept smoothing it anxiously. “Gittin' every mite of the stiff'nin' out,” she muttered to herself. She stopped at a long cottage house, whose unpainted walls, with white window facings, and wide sweep of shingled roof, looked dark and startling through being sodden with rain. There was a low stone wall by way of fence, with a gap in it for a gate. She had just passed through this gap when the house door opened and a woman put out her head. “Is that you, Hannah?” said she. “Yes, it's me.” She laid a hard emphasis on the last word; then she sighed heavily. “No.” She had a little, patient, pleasant smile on her face, looking up at her questioner. The women were sisters. Hannah was Hannah Orton, unmarried. Lucy was Mrs. Tollet. Alfred was her sick husband. Hannah's long, sallow face was deeply wrinkled. Her wide mouth twisted emphatically as she talked. Mrs. Tollet's voice was old, but there was a childish tone in it, a sweet, uncertain pipe. “Well, I'd make him take somethin'. In my opinion he needs somethin' bitter.” She screwed her mouth as if the bitter morsel were on her own tongue. When Mrs. Tollet entered the house she found her husband in a wooden rocking-chair with a calico cushion, by the kitchen window. He was a short, large-framed old man, but he was very thin. There were great hollows in his yellow cheeks. She set them meekly on the pantry shelf; then she came back and stood before her husband, gentle deprecation in her soft old face and in the whole poise of her little slender body. She cooked the bacon and made the tea with no more words. Indeed, it was seldom that she used as many as she had now. 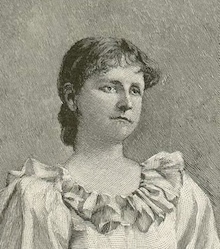 Alfred Tollet, ever since she had married him, had been the sole autocrat of all her little Russias; her very thoughts had followed after him, like sheep. After breakfast she went about putting her house in order for the day. When that was done and she was ready to sit down with her sewing, she found that her husband had fallen asleep in his chair. She stood over him a minute, looking at his pale old face with the sincerest love and reverence. Then she sat down by the window and sewed, but not long. She got her bonnet and shawl stealthily and stole out of the house. She sped quickly down the village street. She was light-footed for an old woman. She slackened her pace when she reached the village store, and crept hesitatingly into the great lumbering, rank-smelling room, with its dark, newly-sprinkled floor. She bought a bar of soap; then she stood irresolute. “Anything else this mornin', Mis' Tollet?” The proprietor himself, a narrow-shouldered, irritable man, was waiting on her. His tone was impatient. Mrs. Tollet was too absorbed to notice it. She stood hesitating. “Well — I don' know; but — p'rhaps I'd better — hev — ten cents' wuth of gentian.” Her very lips were white; she had an expression of frightened, guilty resolution. If she had asked for strychnine, with a view to her own bodily destruction, she would not have had a different look. The man mistook it, and his conscience smote him. He thought his manner had frightened her, but she had never noticed it. “Goin' to give your husband some bitters?” he asked, affably, as he handed her the package. She was trembling all over when she reached her house door. There is a subtle, easily raised wind which blows spirits about like leaves, and she had come into it with her little paper of gentian. She had hidden the parcel in her pocket before she entered the kitchen. Her husband was awake. He turned his wondering, half-resentful eyes toward her without moving his head. Alfred Tollet had always been a very healthy man until this spring. Some people thought that his illness was alarming now, more from its unwontedness and consequent effect on his mind, than from anything serious in its nature. However that may have been, he had complained of great depression and languor all the spring, and had not attempted to do any work. It was the beginning of May now. He began to plant a little and bestir himself. “Alferd's out workin' in the garden,” Mrs. Tollet told her sister one afternoon. She had strolled over to her house with her knitting after dinner. “I guess you must hev imagined it, Hannah. Thar ain't nothin' the matter.” She tried to look unconcernedly at her sister, but her lips were trembling. As the summer went on Alfred Tollet continued to improve. He was as hearty as ever by September. But his wife seemed to lose as he gained. She grew thin, and her small face had a solemn, anxious look. She went out very little. She did not go to church at all, and she had been a devout churchgoer. Occasionally she went over to her sister's, that was all. Hannah watched her shrewdly. She was a woman who arrived at conclusions slowly; but she never turned aside from the road to them. The words seemed propelled like bullets by her vehemence. Lucy shrank down and away from them, her pitiful eyes turned up toward her sister. Mrs. Tollet began to sob. In the course of a few days Mrs. Tollet did tell her husband. He received her disclosure in precisely the way she had known that he would. Her nerves received just the shock which they were braced to meet. They had come home from meeting on a Sunday night. Mrs. Tollet stood before him; she had not even taken off her shawl and little black bonnet. Mr. Tollet pulled off his boots, then pattered heavily about the house, locking the doors and making preparations for retiring. He would not speak another word to his wife about the matter, though she kept on with her piteous little protestations. Next morning, while she was getting breakfast, he went down to the store. The meal, a nice one — she had taken unusual pains with it — was on the table when he returned; but he never glanced at it. His hands were full of bundles, which he opened with painstaking deliberation. His wife watched apprehensively. There was a new teapot, a pound of tea, and some bread and cheese, also a salt mackerel. Mrs. Tollet's eyes shone round and big; her lips were white. Her husband put a pinch of tea in the new teapot, and filled it with boiling water from the kettle. “What air you a-doin' on, Alferd?” she asked, feebly. He sliced his bread and cheese clumsily, and sat down to eat them in stubborn silence. Mrs. Tollet, motionless at her end of the table, stared at him with an appalled look. She never thought of eating anything herself. After breakfast, when her husband started out to work, he pointed at the mackerel. “Don't you tech that,” said he. Never a morning had passed before but Lucy Tollet had set her house in order; today she remained there at the kitchen table till noon, and did not put away the breakfast dishes. He did not turn his head. She sobbed aloud when she said that. He looked startled, and eyed her sharply for a minute. The other performer in the little melodrama which this thwarted, arbitrary old man had arranged was adopting a rôle that he had not anticipated, but he was still going to abide by his own. “Mebbe 'twould be jest as well,” said he. Then he went out of the door. Hannah Orton was in her kitchen sewing when her sister entered. Lucy Tollet gasped for breath; she sank into a chair and leaned her head against the wall. Hannah got some water. No bitter herb could have added anything to the bitterness of that first dinner which poor Lucy Tollet ate after she had left her own home. Time and custom lessened, but not much, the bitterness of the subsequent ones. Hannah had sewed for her living all her narrow, single life; Lucy shared her work now. They had to live frugally; still they had enough. Hannah owned the little house in which she lived. Lucy Tollet lived with her through the fall and winter. Her leaving her husband started a great whirlpool of excitement in this little village. Hannah's custom doubled: people came ostensibly for work, but really for information. They quizzed her about her sister, but Hannah could be taciturn. She did their work and divulged nothing, except occasionally when she was surprised. Then she would let fall a few little hints, which were not at Lucy's expense. They never saw Mrs. Tollet; she always ran when she heard anyone coming. She never went out to church nor on the street. She grew to have a morbid dread of meeting her husband or seeing him. She would never sit at the window, lest he might go past. Hannah could not understand this; neither could Lucy herself. Hannah thought she was suffering less, and was becoming weaned from her affection, because she did so. But in reality she was suffering more, and her faithful love for her imperious old husband was strengthening. All the autumn and winter she stayed and worked quietly; in the spring she grew restless, though not perceptibly. She had never bewailed herself much after the first; she dreaded her sister's attacks on Alfred. Silence as to her own grief was her best way of defending him. Toward spring she often let her work fall in her lap, and thought. Then she would glance timidly at Hannah, as if she could know what her thoughts were; but Hannah was no mind reader. Hannah, when she set out for meeting one evening in May, had no conception whatever of the plan which was all matured in her sister's mind. Lucy watched her out of sight; then she got herself ready quickly. She smoothed her hair, put on her bonnet and shawl, and started up the road toward her old home. There was no moon, but it was clear and starry. The blooming trees stood beside the road like sweet, white, spring angels; there was a whippoorwill calling somewhere over across the fields. Lucy Tollet saw neither stars nor blooming trees; she did not hear the whippoorwill. That hard, whimsical old man in the little weather-beaten house ahead towered up like a grand giant between the white trees and this one living old woman; his voice in her ears drowned out all the sweet notes of the spring birds. When she came in sight of the house there was a light in the kitchen window. She crept up to it softly and looked in. Alfred was standing there with his hat on. He was looking straight at the window, and he saw her the minute her little pale face came up above the sill. Lucy Tollet sped back along the road to Hannah's, hardly knowing what she was about. It is doubtful if she realized anything but a blind obedience to her husband's will, and a hope of something roused by a new tone in his voice. She sat down on the doorstep and waited, she did not know for what. In a few minutes she heard the creak of heavy boots, and her husband came in sight. He walked straight up to her. Add Gentian to your own personal library.